Opening: 11-11-2015 (19:00h) Fundació Antoni Tàpies. Exhibition: 11-11-2015 > 06-12-2015. Description: Screen, computer with internet access and a mouse. On the computer a quiz of 12 questions is installed. Each question has 3 possible answers. The questions confront the visitor to his knowledge on the museum. The answers are crossed with those of previous visitors. The visitor does not know the right answers, only how many visitors have responded better and worse than him. To know their public, museums use questionnaires and audience participation. Mailings, posters and a presence in the media are the best way to attract visitors. Visitors are then registered, analysed and ultimately monitored. Audiences are classified according to age, socio-economic status and geographical provenance. The aim is to know the identity of the different types of audience. But do the public know the identity of the museum they are visiting? Do they know its socio-economic status within the particular context of the city and country in which it is located? Although museums continue to construct a representation of the world by exclusion – showing some things and not others –, the opposite is true in regard to the audience. In this respect, only by being inclusive can the museum organise a device of identification and selection. Museums present themselves as integrating institutions, open to the public in general, and it is precisely this that legitimises them as powerful agents in the context of public institutions. Museums like to understate their presence so they can be seen as an instrument at the service of artists and visitors, an innocuous tool that does not interfere in the communication between the two. And yet, museums no longer legitimise themselves by the works they show, but by their capacity to attract different types of audiences and encourage them to interact. The larger the participation, the larger will be the inclusion of the audience in the democratising discourse strongly defended by museums. A participating citizen is an integrated citizen. Which lead us to suspect that the museum’s interest in knowing the public, in attracting it and encouraging it to participate, is no more than an integrating instrument, or an instrument of manipulation. Asking visitors to take part in a quiz is a way to reinforce the museum’s efforts in introducing the public into the logic of participation. But this time, visitors are not being asked to talk about themselves, or to give away their data, which, in any case, will be known to the museum by monitoring their telephone number or postal address. Neither are they being asked to participate in a democratic pantomime by voting in a referendum that wouldn’t change anything in the long term. The twelve questions in our quiz are about the institution attended by the visitor. A quiz is a questionnaire for the benefit of the people who answer the questions, not those who set them up. The person wanting to know the result of the quiz is the same person that answers the questions. This solitary operation, of no particular interest other than to the person being questioned, allows the visitor to stop being the centre of attention. It’s not that the museum disappears while the visitor is participating, rather that, by taking part in the quiz, the visitor is allowing the institution to emerge. By consciously allowing themselves to be manipulated, visitors choose to be absent and, by doing so, they can perceive the museum from their own perspective. Roger Bernat. Web: Matteo Sisti Sette. Thanks to: Marie-Klara González. 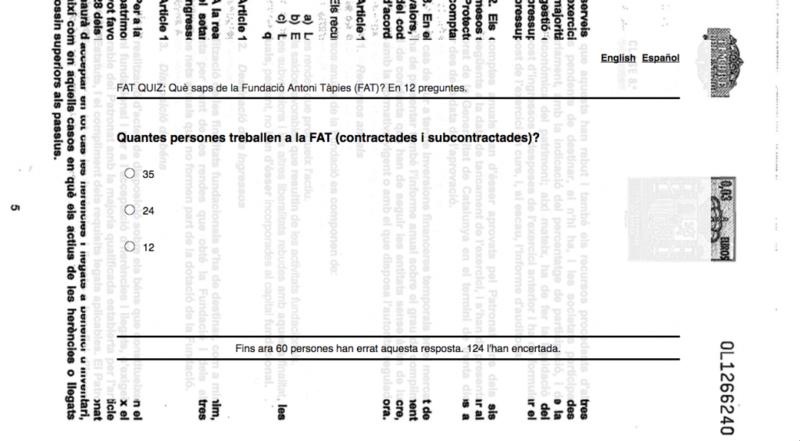 Coproduction: Fundació Antoni Tàpies (FAT). 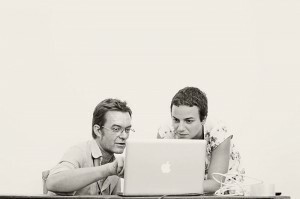 Exhibition: How to do things with documents (Performing the Museum). Curator: Oriol Fontdevila.